Who will win Canadian Car of the Year? Last fall, along with almost 80 of my auto-writer colleagues, I drove and voted on the entrants for the AJAC Canadian Car of the Year and Utility Vehicle of the Year awards. The finalists have been named and the two winners will be announced on February 12. Meanwhile, over at the Toronto Star, I've assembled a list of the finalists and who I think should or will win. Check it out! Of course, the awards are more than just the top crowns. The testing gives us massive amounts of information and data on every vehicle in the running, including subjective items such as ride, handling, interior layout and performance, and objective data such as fuel efficiency, acceleration, and braking distances. All that information is invaluable when you're shopping for a vehicle, and it's available all for free over at AJAC. What's the top new truck? At AJAC's Canadian Car of the Year testing, I was asked to pick my top truck and yap about it on video. So head over to the Toronto Star and have a look! I spent last week in Niagara Falls, Ontario, where some 80 writers, members of the Automobile Journalists Association of Canada, got together to drive vehicles back-to-back and compare them for the prestigious Canadian Car of the Year and Canadian Utility Vehicle of the Year category winners and overall champions. The category winners won't be announced until December, and the champions in February, but the Toronto Star asked me to rate vehicles in two of the categories I judged. Here are my picks for SUV/CUV Under $35,000, and for Pickup Trucks. I can seldom cash a ticket at the horse races, so let's see how I do when the envelopes are opened next month. As a member of the Automobile Journalists Association of Canada, or AJAC, I spent last week in Niagara-on-the-Lake, Ontario, driving and comparing cars to come up with the Canadian Car of the Year and Canadian Utility Vehicle of the Year winners. It's back-to-back testing, all cars in a category on the same day, on the same routes, in the same conditions. But since there were some 80 writers testing and voting, there are always some surprises. The overall winners will be announced next February at the Canadian International Auto Show, but the winners of each category were announced at the event. There were two cars in the new City Car category for electric vehicles, and the Ford Focus EV handily beat the Mitsubishi i-MiEV, even though it was more expensive, primarily because it's far more comfortable and nicer to drive. In the Small Car Under $21,000, the Mazda3 Sedan took the crown over the Chevrolet Spark, Dodge Dart, Kia Rio, Nissan Sentra, and Toyota Prius C. The Dart took fourth place, which surprised me; it's a well-done machine and I thought it would at least crack the top three, if not take the prize. I judged the Small Car Over $21,000, which was a tough one. I like the Chevrolet Sonic, which was also up against the Ford C-Max Hybrid, Hyundai Elantra GT, Mazda3 Sport, and Volkswagen Beetle, but every time I looked at handling, performance, price, and fuel economy, I had to vote the Mazda3 to the top. But the Hyundai Elantra GT, also a very good little car, took the category. I also voted in Family Car Under $30,000, and figured the Honda Accord Sedan would take it, as it did. It had some stiff competition in the Chevrolet Malibu Eco, Ford Fusion, Mitsubishi Lancer, and Nissan Altima, but the Accord is simply a genuinely nice car to drive. Honda has really come back with this one. In Family Car Over $30,000, I pegged the Chevrolet Malibu, but the Ford Fusion Hybrid took it, also winning over the Mercedes-Benz B250 and Toyota Prius Plug-In. I only drove the winner of the Luxury Car category, but it was the Cadillac ATS, which defeated the Acura ILX, BMW 3 Series, Buick Verano, and Lexus ES350 and GS. A Cadillac? Yes indeed, and my heavens, what a job GM has done on this car. Likewise, I only drove the winner in Prestige and Performance: the Porsche 911 Carrera S, over the BMW M5, Chevrolet Corvette 427, and Mercedes-Benz SL550. The 911 is wonderful, but y'know, I actually preferred the perfectly-balanced Porsche Boxster to it, which took the top spot in Sports/Performance Over $50,000, defeating the Chevrolet Camaro ZL1, Ford Shelby Mustang, and Mercedes-Benz SLK55. I also only drove the winner of Sports/Performance Under $50,000, the Ford Focus ST, which prevailed over the Chevrolet Sonic RS, Fiat Abarth, Honda Accord Coupe, Hyundai Genesis Coupe, Hyundai Veloster Turbo, Mini Roadster, Scion FR-S, Subaru BRZ, and Volkswagen Golf R. I thought it would be the BRZ, which placed fourth; its sibling FR-S was second, and the Genesis Coupe was third. I was also assigned to SUV/CUV Under $35,000, another category of close contenders: Chevrolet Trax, Ford Escape, Honda CR-V, Hyundai Santa Fe Sport, Mazda CX-5, and Subaru XV Crosstrek. I thought the CR-V should have taken it, but it finished third behind the Escape and Crosstrek. The Best New SUV/CUV $35,000-$60,000 wasn't a regular category for me, so I only drove the winner, the Hyundai Santa Fe Sport 2.0T, which prevailed over the Acura RDX, Chevrolet Traverse, Ford Escape 2.0L, GMC Terrain Denali, Infiniti JX, Lexus RX350, and Nissan Pathfinder. So who will take home the hardware in February? I think the three finalists are going to come down to the Honda Accord, Hyundai Elantra GT, and yes, the Cadillac ATS, and I feel that the ultimate prize should go to the Accord. For the two finalists in Utility Vehicle - the Ford Escape and Hyundai Elantra - I wouldn't want to be placing any bets. And of course, despite all the driving we did and the points we awarded, it all comes down to using these ratings as a guide ... and buying the car that's right for you, not necessarily the one we pick. Read this to find out why. The Ford Fusion has been named the 2010 Motor Trend Car of the Year. It was the first magazine to offer such an award -- the initial one was in 1949 -- and it's still considered the biggest of the big, or at least, the one that the general public is most likely to recognize. And I think they hit the nail on the head with this one. It went up against some pretty big guns, including vehicles I think were equally worthy of the crown -- Buick LaCrosse, Hyundai Genesis Coupe, Mazda3 -- and even some high-end stuff that's among the better cars I've driven, like the BMW Z4, Mercedes-Benz E-Class, and Porsche Panamera. A lowly Ford Fusion defeating the mighty Panamera, or the zippy Z4? The enthusiasts are tearing out their hair, and tearing up their subscriptions even as we speak. But they miss the point. Motor Trend -- and other awarding bodies that get it right -- doesn't necessarily crown a car because it's the best one in the batch. Instead, it's the car that gets it right for its intended audience. In many cases, that's an audience that has no idea what's going on under the hood, but needs a car that'll handle the job. Motor Trend noted that the Fusion comes in a wide assortment of models, gets good fuel economy, offers a hybrid, has lots of passenger and cargo space, and can be ordered with higher-end options if desired. Sure, the fit-and-finish and material quality don't come close to BMW or Mercedes. It'll still be getting its front wheels over the start line when the Panamera's at the finish. But that means nothing to someone whose car budget taps out at $18,000 -- and there are a lot of people whose car budget taps out at $18,000. Auto companies listen to journalists, but they sell cars to average buyers. This time around, the journalists listened to the average buyers, too. Well, it's all over for another year: Testfest, the annual back-to-back evaluation by members of the Automobile Journalists Association of Canada to determine category winners, and then the overall Canadian Car of the Year and Canadian Truck of the Year champions. As always, it was both fun and exhausting. There were occasional hiccups and frustrations, but it still amazes me that this whole thing goes as smoothly as it does, given the number of cars, manufacturers and journalists that are attending. Kudos to the team that puts it all together. Here's how it works: journalists come from across Canada to Niagara-on-the-Lake, Ontario, where we're met with rows and rows of eligible vehicles. We're all assigned to various categories. We have to drive all of the entries on the same day, back-to-back, on public roads and then, depending on the vehicle, either on a track, or an off-road course, or both. Then we rate them on a long list of factors, and move on to the next. At the end of the event, the category winners are announced; you can see what took this year's honors by clicking here. We then have to drive any winners we haven't been in, and rate them again. This will determine the overall winners, which will be announced in February. - The car that most surprised me, as I've mentioned here earlier, was the Porsche Panamera. I think it was the four-door styling that threw me. I simply wasn't expecting it to accelerate or to handle the way it did. It defeated the mighty V10-powered Audi R8, and that's no mean feat. - I know we're supposed to be stone-faced objective, but I felt really sorry for General Motors. It got shut out in a year that it brought some of the best vehicles it's ever built, and I think part of that is due to the limitations that Testfest can experience. There must be at least three eligible vehicles to form a category, which means that some vehicles don't get to Testfest at all (which is why the superb Ford F-150 SVT Raptor couldn't compete; there weren't any other new qualifying trucks). In other cases, vehicles get moved into categories where they really don't belong. The Buick LaCrosse should have been in Luxury Under $50,000, but since there wasn't anything else to form that category, it got moved into Family Car, where it was trounced by both the Ford Taurus and Fusion Hybrid. Both of those are worthy vehicles, but they're not really in the same segment. - I also disagreed with a decision that took the BMW Z4 out of competition. It was in the Convertibles category, but BMW brought models equipped with manual transmissions, and the Car of the Year committee felt that put it into a sportscar category. Since BMW couldn't deliver three automatic-equipped cars that day, it was out of the running. Wrong, wrong, wrong. - One of my categories included the Kia Forte Koup, my first time in the car. Kia certainly has come a long way with its vehicles, especially the interiors. The Koup also impresses with the biggest back seat I think I've ever seen in a two-door: once he manages to squeeze past the front seat, a linebacker would be comfortable back there. But one thing I noticed is that, while the Koup's sweet styling makes it look like a canyon-carving sports performer, it drives like what it is: an inexpensive, entry-level vehicle. It understeers like a snow plow: I took out a whole row of cones on my first trip around the track with it, and I wasn't the only one. Its price falls right into the laps of young, inexperienced drivers: I expect to see more than a few of these firmly wrapped around trees when they take their first hard turn a bit too fast. - My goodness, Audi makes some sweet cars. I fell head-over-heels in love with both the A5 Cabriolet and the S4. Driving them is like steering a vat of cream. Even the Q7, a vehicle I don't normally like all that much, impressed me once the company stuffed a diesel under the hood. The all-plastic interior doesn't look like an SUV that costs $65,000, but the driving experience sure feels like it. Speaking of diesel, three oil-burners took their categories: the BMW 335d sedan (one of my faves), VW Golf Wagon TDI, and VW Touareg TDI. - With so many journalists from so many backgrounds, you're bound to get all styles of evaluation. I have a pet peeve about those -- not many, mind you, but there are a few -- who see this merely as a chance for free track time, or who race through the categories with the singular goal of seeing how many they can rack up over three days. You simply can't evaluate vehicles that way. On the other hand, I also love Testfest because it gives me an opportunity to spend a week with my colleagues. Too often we work in a bubble in this job. It's nice to see everyone again. - There had been a catastrophic fire in Niagara-on-the-Lake earlier in the week, and at least four people were left homeless. The city is always good to us, and so a bucket was passed around for donations. Between the journalists, a matching donation by the Car of the Year association, another by an anonymous donor, and donations from automakers, more than $5,000 was raised in less than 48 hours, which was given directly to the fire department to distribute to the people involved. - And my final word? I'll sum it up by saying: click here. I've just spent five days in Niagara-on-the-Lake, Ontario, as one of about 80 journalists helping to judge the Canadian Car of the Year awards. It was pretty tiring, with 56 vehicles in 14 categories, and with the vehicles in each tested back-to-back. All went out on the street; cars then went on a racetrack course, while SUVs, crossovers and trucks went on an off-road course. Each was then rated by each journalist on a variety of subjective measures including handling, styling, quality, ergonomics and performance; objective testing is also done on acceleration, braking and a price factor, which is further added into the scores. You do as many as you can; I tested and voted in seven segments. Usually, someone goes off and counts all the votes, and some time later the segment winners are brought together and tested again to pick the overall Car and Truck of the Year. This year, to avoid the difficulty and expense of two separate contests, it was done differently; the segment winners were announced on Friday, and then if you hadn't driven them all, you had to go out in the ones you'd missed. I have a news report up on Canadian Driver, available here, which lists all of the category winners. I drove Godzilla. Yes, the Nissan GT-R was there, and it's as rip-snortin' as you've heard. It takes to the track like no tomorrow. But it had some pretty serious competition, and I have to admit that if I had my lottery money in hand, I'd probably look at the Cadillac CTS-V or BMW M3 first, because they're not as rough on the street. The Lexus IS F is really sweet, too (although it's got the ugliest exhaust treatment I've ever seen, with quad stacked pipes). The CTS-V was the real surprise. Cadillac's done an absolutely incredible job on this car. Luxury Car. One of my categories was Luxury Car Under $50,000, which included the Audi A3, Acura TL, Infiniti G37X Sedan, Saab 9-3 Sport Combi ... and the winner, the Hyundai Genesis. Think you'd ever hear that? I don't know if Hyundai will be able to sell a pricy car just yet, given the fact that they're known for entry-level, but this car is really, really nice, especially when you factor in the price. Some really sweet machines: The drop-top Audi TTS goes like stink, corners flat, makes the sweetest blip out the tailpipe when shifting, and put a smile on my face; it's awesome. The Pontiac G8 with V6 engine is very well done; it's a shame it looks like a front-wheel-drive car. The Audi A4 is a very good makeover and I just love those LED running lights. The Mercedes SL63 AMG is a delicious car. Acura's SH-AWD (Super Handling All-Wheel Drive) is incredible technology; I tossed the Acura TL around the cones like it was on rails. And the Mercedes BlueTEC diesel is so quiet and smooth, you'd never know it's an oil burner. Things that make you go hmmm: The Kia Magentis and Hyundai Sonata are basically the same car under the skin, so why does the Magentis accelerate and handle better? Likewise, the Toyota Matrix and Pontiac Vibe are twins, but I thought the Vibe was quieter. I want to know why Acura dashes have to be so damn busy; they look like jet fighter cockpits and it's impossible to find a control quickly when you're trying to drive. And did Jaguar owners really clamor for a starter button that flashes to mimic a heartbeat, a gearshift that rises up out of the console, and vents that close themselves when you turn the car off? Some biased opinions: The Dodge Ram is well done, but I think the Ford F-150 should have won, based on its abilities. The Mercedes SL63 AMG should have beaten the BMW X6. The four-cylinder Suzuki Grand Vitara wasn't included because the committee thought its makeover wasn't sufficient, but I think it should have been there. My predictions? I think Car of the Year (which will be announced next February) will be the Mazda6, and Truck of the Year will be the Ford Flex. That said, there's a reason why I don't make my living as a gambler, so don't hold me to that. * Edited to add: I just got a bulletin informing me that the numbers were wrong and that there's a tie between the Mercedes-Benz CL550 and the SL63 AMG, with the BMW X6 one point behind them. This should be interesting ... especially given that the newspapers all took their photos of the winners grouped together! It's a busy, exhausting and very fun week -- I'm at Testfest. Each year, the Automobile Journalists Association of Canada, of which I'm a member, meets at a single location with every eligible vehicle for the Canadian Car of the Year and Truck of the Year awards, and drives them back-to-back. This year there are 56 vehicles in 14 categories. Each writer is assigned a specific number of categories that must be completed (mine this year is small cars, family cars and entry-level luxury), and once those are done, if time permits, we move on to other categories. So far I've done one category beyond my required number, and I plan to get a couple more under my belt today. We start off on a track, and then go onto public roads, assessing everything from steering and handling to passenger comfort, ergonomics, and value. Along with our subjective rating, the cars are also tested separately for timed acceleration and braking, and price is factored in. It's quite a lot to do over five days, but there's just something about arriving at the site each morning to the rows and rows of cars that gets the blood going and really wakes me up. We've got everything here from the Honda Fit to the Nissan GT-R, from the Chevrolet Aveo to the BMW M3, from the Ford F-150 and Dodge Ram to the Jaguar XF, Lexus IS F, and Mercedes SL63 AMG. Unusually for this year, the category winners will be announced this Friday, October 24. Usually it's done later, but this will let us then test for the overall winners without bringing everyone back in a month or so. The two final winners will be announced in February at the Toronto Auto Show. And now, if you'll excuse me, I need to go get me some keys. Car of the Year: Does it matter? The Automobile Journalists Association of Canada (AJAC), of which I am a member, is in a bit of an uproar over the story behind this photo. That's the Audi R8, a car that costs $139,000 and will sell about 100 copies in Canada. 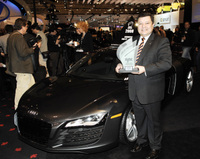 The award that Audi president Diego Ramos is holding is AJAC's 2008 Canadian Car of the Year. But all of that aside, it brings me to another question: are Car of the Year awards now so common that they really don't mean much anyway? Car of the Year awards effectively began in 1949, when Motor Trend magazine gave its inaugural one to Cadillac in recognition of its new high-compression, overhead-valve V8 engine. During the early years, it went to a manufacturer, not a car, and for three years it wasn't awarded at all. Now, every publication and every association names its annual winners. Car and Driver, Green Car Journal, Road & Track, Top Gear, What Car, MSN, and even Mother Proof name theirs, and there are many more. There's a North American Car of the Year, a European Car of the Year, a World Car of the Year, an International Car of the Year, Japan Car of the Year, and even a Lithuanian Car of the Year. AJAC says that surveys indicate more than half of new-car buyers are influenced by its award. Perhaps in Canada that's very true, since we have fewer "best of the best" handouts across the country, and the AJAC award is the biggest. Even so, when thousands of pieces of hardware get handed out each year, it does tend to water it down. The smartest buyers will look at awards specific to their needs. You want the best van to haul your children, you go to Mother Proof, because they aren't wowed by 420 horses. Their testers look at stuff that matters to buyers with $25,000 to spend. Or buyers should look past AJAC's single Car of the Year, and look at each of the category winners. Someone with $139,000 and a hankering for an R8 doesn't care if it took Car of the Year or it ended up at the bottom of the pile. It's the folks who work hard for their money and can't afford to spend a lot of it who should be the focus of Car of the Year awards. Look at the cars, but look at the audience, too. Maybe then these awards will be relevant again.